Three thousand years ago a war took place that gave birth to legends - to Achilles, the greatest of the Greeks, and Hector, prince of Troy. It was a war that shook the very foundations of the world. But what if there was more to this epic conflict? What if there was another, hidden tale of the Trojan War? Now is the time for the women of Troy to tell their story. Thrillingly imagined and startlingly original, For the Most Beautiful reveals the true story of true for the first time. The story of Krisayis, daughter of the Trojans' High Priest, and of Briseis, princess of Pedasus, who fight to determine the fate of a city and its people in this ancient time of mischievous gods and mythic heroes. 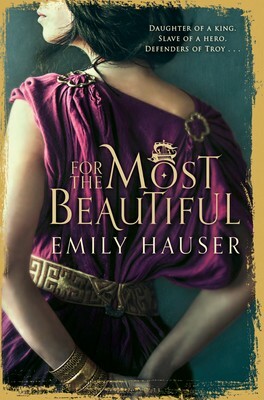 In this novel full of passion and revenge, loyalty and betrayal, bravery and sacrifice, Emily Hauser breathes exhilarating new life into one of the greatest legends of all - in a tale that has waited millennia to be told. "Brings ancient Troy wildly, raucously, passionately alive." (Manda Scott, author of Boudica). As a Classics geek I loved this book, especially as it was told from the female perspectives of the Trojan War which is always an interesting insight to ancient history. For a classics geek like me, this was really enjoyable. It's a story about the women in the Iliad, the women who set so much of what happens in Homers epic poem into motion, but have barely any lines.